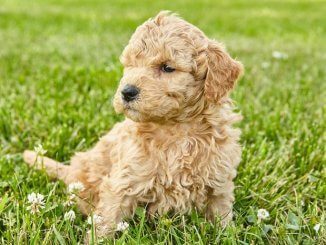 HomeDog BreedsMiniature Golden Retriever: Do These Dogs Exist? A relatively new designer dog, the Miniature Golden Retriever has been bred for all the impressive qualities of a Golden Retriever, but, without the size. Standing between 14-18″ in height (compared with 22-24″ of a Standard Golden Retriever), and weighing between 20-55 pounds, the Mini Golden Retriever first appeared in 2003. The friendly Golden is a perfect addition to any family and a good choice if space is limited or the large size of a Retriever is a concern. This mixed breed is not a Goldendoodle, or a dog suffering with Dwarfism, but is actually a designer mix trademarked as a Comfort Retriever. 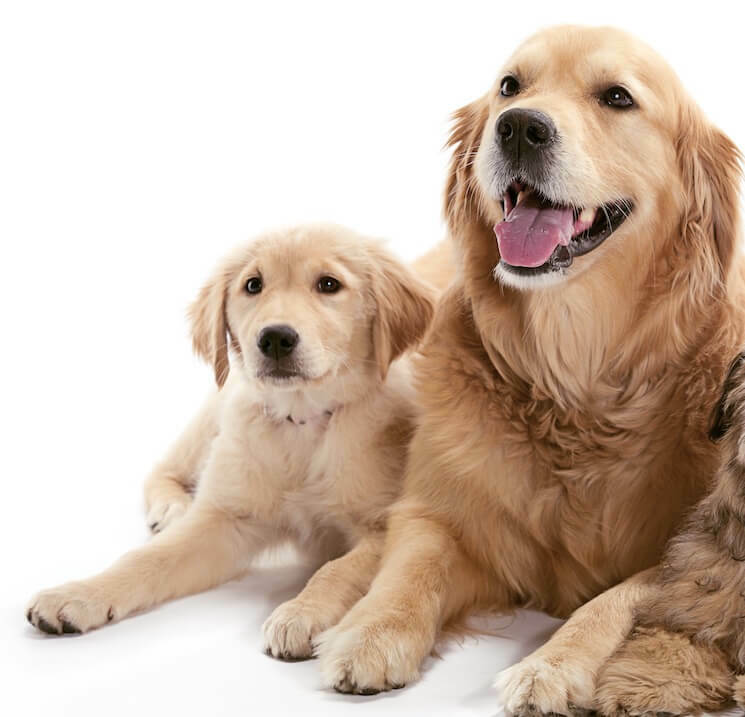 Generally boasting the same temperament as the full size Golden Retriever, the Mini Golden tends to shed less and its smaller body is often easier to handle and manage for families with young children or those older owners. In this article we will get to grips with this adorable dog, sharing our owner’s guide, facts, pictures and more. Originally bred by crossing a Golden Retriever with a Cocker Spaniel in 2003; these pups were often unpredictable. Since 2007 Miniature Goldens are more commonly crossed with a Poodle to achieve their smaller size and a more stable temperament. Despite the original Golden Retriever being recognized by the American Kennel Club as a purebred dog, the Mini Golden Retriever is not recognized. Want a Freebie? Download your free copy of our Miniature Golden Retriever owner’s guide to learn more about this designer mix breed. This adorable ball of fluff is still a relatively new mix. Some take the name, miniature, quite literally and think this designer breed is just a dwarf dog. With this, comes concerns about breeding dwarf dogs due to the health issues they suffer. Dwarfism in dogs is a result of abnormal development in bone and cartilage which can cause pain. Some dogs develop arthritis very early on in life, requiring lifelong medication. But the Miniature Golden Retriever is not a Dwarf. It is as mixed hybrid dog as a result of mating a Golden Retriever with either a Cocker Spaniel or more commonly a Poodle. The product is the same loved temperament of the Retriever but the smaller size from the Spaniel or Poodle. So imagine the most popular dog breed in the world, with their loved temperament, loyalty and family nature and make it smaller. That’s what you have here. Let’s take a look at the parent breeds in a little more detail. First bred in 2003 the Mini Golden Retriever was a mixed breed as a result of a Golden Retriever and Cocker Spaniel mating. However, since 2007 Mini Golden Puppies are bred with a Golden Retriever and a Poodle. Ranked number three of 192 for popularity with the American Kennel Club, like the Silver Lab, the friendly Golden Retriever is loved for its gentle nature, devotion to its family and eagerness to please. Historically a Scottish Gun Dog, these incredible animals didn’t arrive in the states until the early 1900s. They were loved for their work ethic but adored for their sweet nature and their popularity soared in the 1970’s when President Ford introduced his Golden (Liberty) to the world. High energy, goldens suit families with an active lifestyle with a yard to romp and play. The original mix for the Mini Golden Retriever was a cross between the Golden Retriever and the Cocker Spaniel. Another gun dog, but this time originating in Spain, Spaniels were bird hunters. The Spaniel eventually made its way to the States before being separated into two separate breeds by the American Kennel Club in 1946. The Cocker Spaniel is the American type and the English Cocker Spaniel is the British Spaniel. The English being taller and having a longer head. The size difference is likely why the Cocker Spaniel is used in the Miniature Golden Retriever lines. Athletic, gentle and happy is how a Cocker would be described. However, as a breed there have been health concerns raised regarding its susceptibility to rage syndrome. This is defined as a serious behavioral problem where there is a sudden onset of aggressive behavior – for this reason, most miniature golden retrievers are now a result of mating a full-size Retriever with a Poodle. Active, proud and incredibly smart, it’s no wonder the Poodle was used to breed this family orientated hybrid. Another working dog, the Poodle originated in Germany as a duck hunter. Impressive swimmers, Poodles are adored for their trainability. Unfortunately, Poodles do suffer an array of health issues including hip dysplasia, luxating patellas, Legg-Calve-Perthes, von Willebrand’s disease, sebaceous adenitis and Addison’s disease. These conditions could potentially appear in your Miniature Golden Retriever. Originating in the US in 2003, the Mini Golden Retriever is gaining more and more popularity with litters exceeding $5,000 USD per puppy. 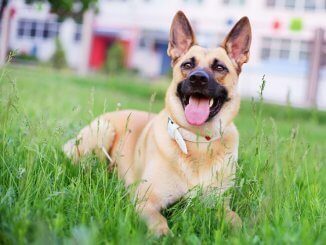 For this reason, it is essential to research a reputable breeder if you are considering adding one of these adorable pooches to your family you can also explore adoption. Just like the full size Golden Retriever, the Mini Golden Retriever is friendly, happy and easy going. They are a dream addition to any family; providing you spend the time training and socializing of course. They are gentle with toddlers but equally love romping in the yard with the teenagers. Full of energy, your Miniature Retriever is a loyal hiking partner or if you’re running short on time, they are likewise in their element playing with their friends in the dog park. Not renowned for barking, they will only alert you to the doorbell or the mail man. The Mini Golden Retriever loves everyone and think everyone loves them. For this reason, they generally tolerate all other household pets and humans when socialized from a young age. Thanks to their intelligence and willingness to please they excel in obedience classes and their energy makes them a perfect candidate for agility classes. As much as we have a pretty good idea on the temperament of the Golden Retriever, you must remember this is a hybrid. For that reason, you could get some of the less favorable traits of the Poodle – including anxiety and high stress levels. Although rare, they can suffer with separation anxiety, this is also more likely if it’s a Spaniel cross. The Miniature Golden Retriever is a great addition to any family (young or old, with or without children). They are friendly, sociable and generally low maintenance. Their smaller body fits in perfectly to those smaller homes or even apartments. Despite this, they still have the same needs as any other dog. Let’s see if you’re ready to open your home to this dog. Being slightly smaller, the Miniature Golden Retriever will also eat slightly less than a full-size retriever. They are described as being medium sized (weighing in typically around 50 pounds) so will eat on average 30 calories per pound of body weight per day. If your designer mix is weighing in at 50 pounds, he will eat around 1,500 calories per day. This will vary depending on activity level; highly active dogs will eat more calories as they use more. Ensure the food you are feeding is good quality and it meets your dog’s daily nutrient requirements. As a puppy, 22% of his diet should consist of protein sources and 8% of his diet should consist of fatty sources. Once matured 18% of his diet should be made up of protein and 5% fat. 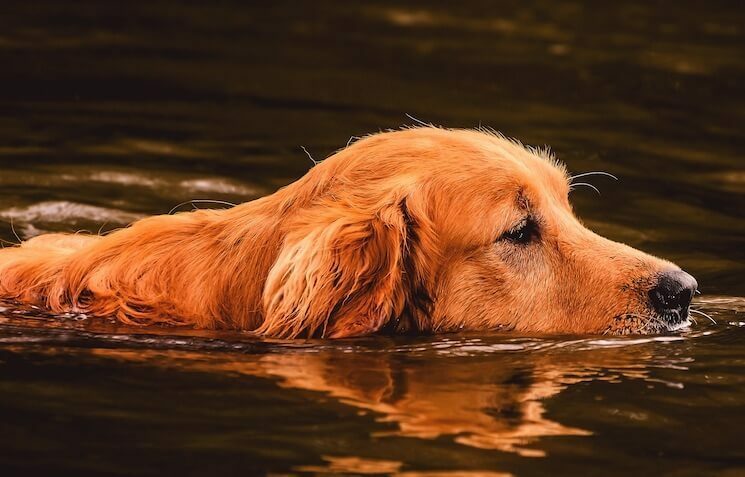 Water is another essential requirement for your Retriever mix, dehydration can be a serious issue, especially active dogs in hot climates. For this reason, clean, fresh water should always be available for him to drink. How much he drinks will often be influenced by the type of food you feed. Canned food contains on average between 60-90% water whereas dry kibble contains between 3-11% water. For this reason, you would expect dogs fed a dry diet to drink more water than those fed a canned diet. Speaking of walking, your Mini Retriever will certainly need his daily exercise. Ideally between 30-60 minutes will keep him in shape, with some mental stimulation thrown in for good measure. With both purebred parents (Golden Retriever and Poodle) coming from working lines, the endurance and need to be active is still present. For this reason they make perfect hiking buddies. Not just active, they are very playful, their ancestors were retrievers after all. They will play ball all day if you let them and the bonus is, you’ll always have something to keep him occupied. With early training and socializing, they excel in obedience, agility, flyball and water tests. If you see another dog on leash, recall yours back and put them on leash. If you can’t see ahead, put your dog on leash. 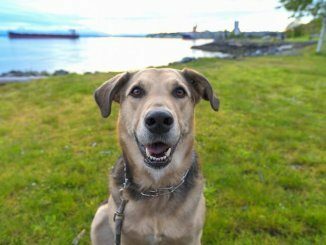 Like all dogs, this hybrid responds best to positive reinforcement and reward-based training and like other Lab mixes they are very intelligent. He’s decided to run through the kitchen with your slipper – find one of his toys, get his attention and swap the slipper for the toy. Punishment doesn’t deter behavior it just creates and exacerbates problematic behavior. The other key element in avoiding problematic behavior is early and continued socialization. When we talk about socialization, we’re not just focusing on mixing with other dogs. We’re talking about him meeting people, different people wearing different clothes or cyclists wearing helmets. We’re talking about him experiencing strange and new noises, machinery, equipment and appliances. Everything the modern world has on offer. When a dog experiences something, they make a connection in their brain, they also make the association of whether this was a positive or negative experience. We need to introduce new things in a safe and controlled way. Despite the common understanding that cross-breeds, hybrids and mongrels are generally healthier, this is not always the case. What we are noticing, is the Miniature Golden Retriever does share some health concerns with its parent breeds. Thanks to the Poodle, we are seeing: hip dysplasia, luxating patellas (i.e. kneecap dislocation), Legg–Calvé–Perthes (i.e. hip disorder), von willebrand’s disease, sebaceous adenitis (i.e. inflammatory skin disease) and Addison’s disease. Combine these with the health issues of the Golden Retriever such as: juvenile cataracts, pigmentary uveitis, progressive retinal atrophy and subvalvular aortic stenosis (i.e. heart defect). You can see why it is essential to research a reputable breeder who is carrying out the necessary testing on their breeding dogs to reduce the chances of these health concerns. The Mini Golden Retriever really is just a Mini Retriever. They tend to come in cream, gold or red coloring. Standing on average between 14-18” and weighing between 20-55 pounds, these adorable pooches usually boast a slightly wavy coat. Most of these designer dogs are solid colors (e.g. gold or cream) but some have been known to have white markings on their chest. Low on the grooming front, two to three brushes a week will be ample to keep their coat in great condition. Thanks to the Poodle parent, they don’t shed as much as their full-size parent, so you will notice less hair around your home. Whilst we’re on the subject of the Poodle parent, we know that they suffer with reoccurring ear infections, it is worth regularly checking and cleaning their ears regularly. Just what their name suggests, the Miniature Golden Retriever is just that. A friendly, gentle and easy going dog, just a little smaller than other Retrievers. A perfect addition for any family, because when trained and socialized from a young age, the Miniature Retriever gets along with small children and other household pets. Super trainable and eager to please, the whole family can get involved with his reward-based training and showing him what the world has on offer. Early hybrids offer the spaniel personality, which may be of concern to some, but more recent mixes boast the low shedding coat and the high intelligence of the Poodle. Looking for an outgoing, adaptable and energetic companion but would rather a smaller body to fit in your home? Look no further than the Mini Golden Retriever. Give us your thoughts in the comment section below. Great to hear your love for Goldens! They are a very popular breed, you can start by reading our guide to finding a breeder.